Aging punks recapture the greatest show of their youth through barbaric rituals. The lone survivor of a hellish Interstate pile-up follows an otherworldly sound to its source. A father desperate to cure his daughter’s condition uncovers a multinational corporation’s unspeakable plan for solving world hunger. 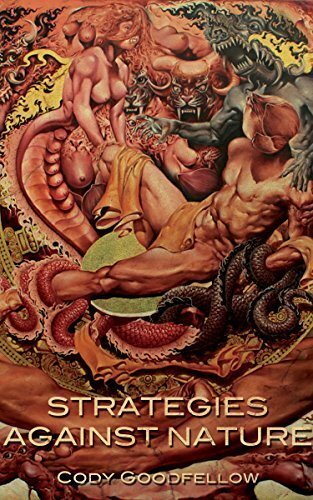 In these eleven stories, Cody Goodfellow explores the bizarre and the deeply human, using the kaleidoscopic language only he is capable of. These tale come from a great factory of creation, potent prose, myriad of peoples and horrors, nature things laid down one word after the other with a distinct style, voice, and word usage. With this collection he successfully writes works with horror addressing many real fears, tapping into the subconscious of the reader with memorable masterly crafted stories. A car incident, there will be mayhem, terrible scenes with original prose style. This one was selected for The Best of the Best Horror of the year, edited by Ellen Datlow. Mythology in the narrative, girls, women, horses and a Madame taking care of girls, hunters raised to kill, with something to go wrong in the tale with this breeding of destruction. The wilderness, nature in battle with the concrete world, a mans intuition to sculpture something grande, a skill passed down from forefathers. The rage and anger at the cities despoiling and abuse of nature, and what become of the land, corruption and capitalism of it, and so a darker force unleashed in reply. Hate borne into creation, creation into destruction, destruction into captivity. Youth with underground experience a truly out of this world extreme extravaganza awaits new blood. Father and daughter are pawns in a sinister play on corporate corruption and consumerism manipulation and inception of American lives. The adage we are are what we eat suits this down to a tea.